Every civilized human being is rightly outraged by things like the vicious murders committed by members of the international Salvadoran gang MS-13, the fatal beating of the 76-year-old Georgia resident Robert Page by undocumented Mexican immigrant Christian Ponce-Martinez and other appalling acts committed in the U.S. by people who were born elsewhere. Immigration issues, including the question of whether immigrants are disproportionately responsible for crimes, have been on the front burners of Americans’ consciousness for several years. As Jews, we have good reason to favor, at least within reasonable limits, the welcoming of new Americans. Most of us ourselves descend from fairly recent immigrants, many of whom said Kaddish for other would-be Americans who were prevented by quotas and prejudices from finding refuge on these shores. But Jewish immigrants to the U.S. have overwhelmingly been law-abiding and contributors to the economic growth and well-being of American society. What, though, about the current wave of immigration from points south? Are those Central Americans and Mexicans who aspire to living and working in our country of similar bent, and potential? Or do they endanger Americans’ safety and security? Ascertaining if there is a significant relationship between crossers of the U.S.-Mexican border and criminal acts committed on American soil requires looking not at narratives but at numbers. When comparing different populations’ crime rates, controlling for the size of the population is essential. And so, researchers plumbing that data look at the numbers of convictions per 100,000 members of a particular group. And the resultant numbers are striking. Most law enforcement agencies’ crime data don’t include violators’ immigration status. But Texas, a border and law-and-order state, does; its police cooperate with federal immigration enforcement authorities at the Department of Homeland Security who check the biometrics of all arrestees in the state. The individual liberty, limited government and free markets-promoting CATO Institute, formerly the Charles Koch Foundation (yes, that Charles Koch), has analyzed Texas crime data over the year 2015 – the most recent year for which all the relevant figures are available. It found that the criminal conviction and arrest rates for legal immigrants in most criminal categories were markedly… below those of native-born Americans. 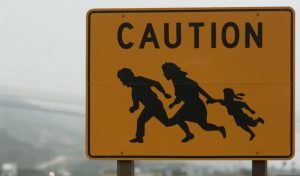 Even the conviction and arrest rates for people who immigrated illegally were lower than those for those who were born and raised in the U.S.
During that year, reports CATO, as a percentage of their respective populations, the criminal conviction rate for legal immigrants in Texas was about 66 percent below the native-born rate, and 50 percent lower than native-born Americans for illegal immigrants. Limiting the findings to homicide cases alone, the conviction rate per 100,000 people for native-born Americans was 3.1; for illegal immigrants, 2.6; and for legal immigrants, 1. All of those facts might seem counterintuitive, or at least counter-assumptive, but, surprising as they may be, they are borne out as well from the documented lack of any positive effect on crime rates in localities that enacted enforcement programs focused on deporting illegal immigrants. There are many matters attendant to the issue of immigration that need to be carefully considered: What should be done about the more than three million “Dreamers,” undocumented young people who have been in our country since childhood; what should qualify as grounds for asylum; the economic impact of increased immigration (though it’s generally positive, low-wage workers may suffer if immigration numbers grow); how to most effectively and sensibly secure our borders; how to deal with those seeking to enter the U.S. as families; what kin should be permitted to join their legal immigrant relatives already here; and more. All are legitimate matters for discussion, and none have obvious, straightforward answers. But in those conversations, one thing is, or should be, absent: the notion that immigrants, even those who have crossed our borders illegally, are more likely than good ol’ Americans to be criminals.